Yesterday morning, Emma lost her first tooth, much to my parents' dismay, I'm sure. She was very excited and promptly put it under her pillow in hopes that the Tooth Fairy would pay her a visit while she was sleeping. Well, the Tooth Fairy was a bit lazy and didn't actually collect the tooth until after Emma had gotten out of bed. (oops!) But she did receive a dollar, so all is well....Or so we thought. 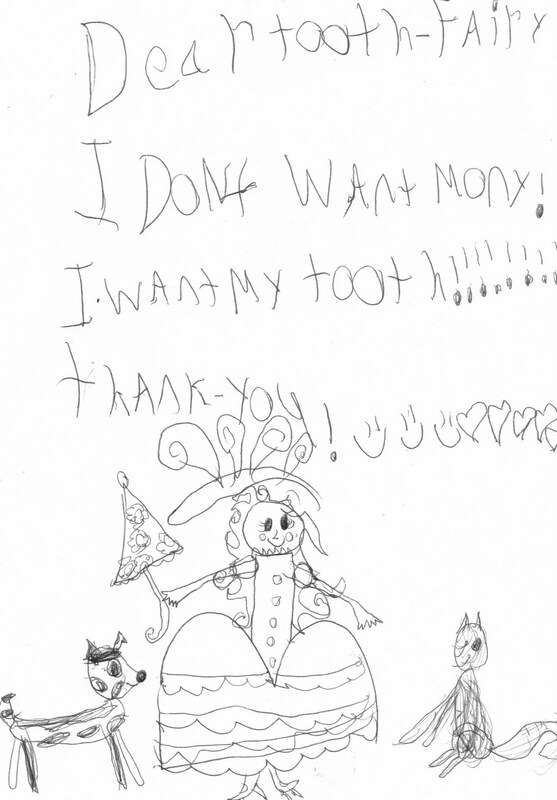 In case you couldn't read it, she wrote: "Dear Tooth Fairy, I don't want money! I want my tooth!!!!! Thank you!" Complete with smiley faces and hearts. At the bottom, she illustrated a beautiful fairy, and her pet dog and cat. Well, I explained to her that after the Tooth Fairy takes your tooth, you usually can't get it back. She was a little sad at this, but sprung right back into her typical cheerful mood when I reminded her that she still has plenty of teeth to lose, and next time she can keep the tooth if she likes. 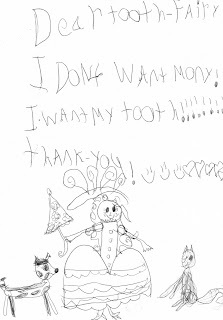 For those uninitiated in phonetic spelling, it says: "Dear Tooth Fairy: Please collect my tooth. It is loose. I can wiggle it. Thank you." I love the smiley faces and the hearts--they really show how happy and excited she is. She didn't bother to sign it, but of course, fairies know everything, don't they?